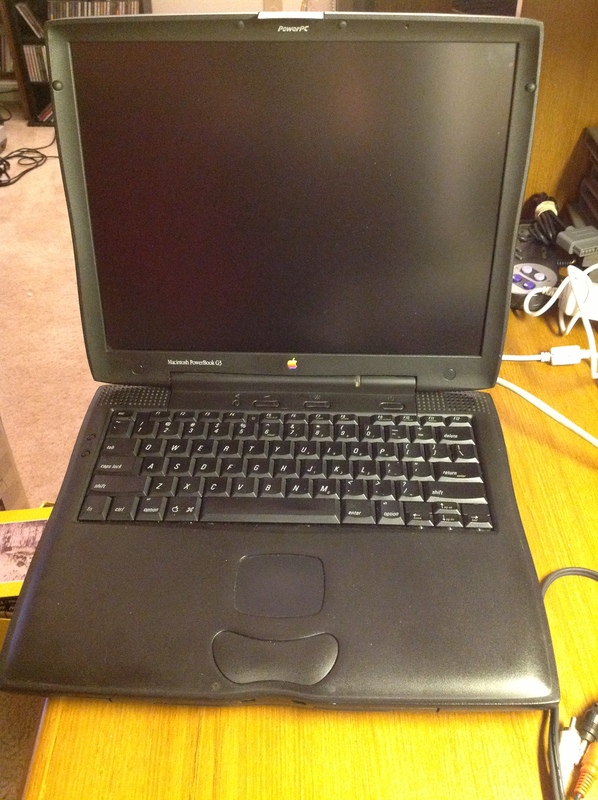 There was a period in the late 90s and early 2000s when finding old computers, especially Macintoshes was a regular occurrence at the local thrift stores. I’ve basically been a Wintel guy since the mid 90s but the collectability of old Macs piqued my interest. These were not generic beige boxes; Macs had well-documented stories. I quickly accumulated a Mac 128K (that had been upgraded to Mac 512K specs), a Mac Plus, a Mac SE, a Quadra 700, and a Mac LC (I still have some of these machines and plan to do posts on them someday). However, there came a point in the mid-2000s when these machines stopped showing up at thrift stores. Today, it has become really difficult to find classic computers at thrift stores. Partly I think this is because the larger stores such as Goodwill are concerned about the privacy and licensing issues of selling old PCs. They have to be concerned with with the previous owner’s data and would rather recycle the PCs than deal with wiping them properly and the license hassle of reinstalling software for resale. I think it’s also because the smaller stores don’t understand there is a collector market for vintage PCs and they think that older computers are too difficult to sell. People alo probably only keep one or two generations of old computers in their house so in many cases they’ve already trashed most of the really vintage stuff. The good old days I experienced in the late 1990s and early 2000s have come and gone. As a result, I have decided as a general policy that if I see an interesting computer at a thrift store I should pick it up because I never know when I’ll see one again. However, for whatever reason I never saw Macintosh laptops at thrift stores, even in the good-old-days. Imagine my surprise one day in 2011 when I saw this lovely Apple Powerbook G3 sitting on a pile of old furniture at the Abbey Anns off the Circle in Tallmadge. It was really dirty and covered in stickers but as far as I could tell it was complete. There was no power supply included and the battery was clearly dead so I ended up buying it for about $15 without knowing if it worked. After buying a knock-off power supply from eBay I was amazed to find that it indeed still worked! With that said the hard drive now makes some awful sounds and sometimes takes several attempts to start so it could probably die at any time. Going from this badge I believe this Powerbook G3 to be the “Wallstreet II/PDQ” model as that’s the model that came with the 266MHz processor while still having the colored Apple badge. 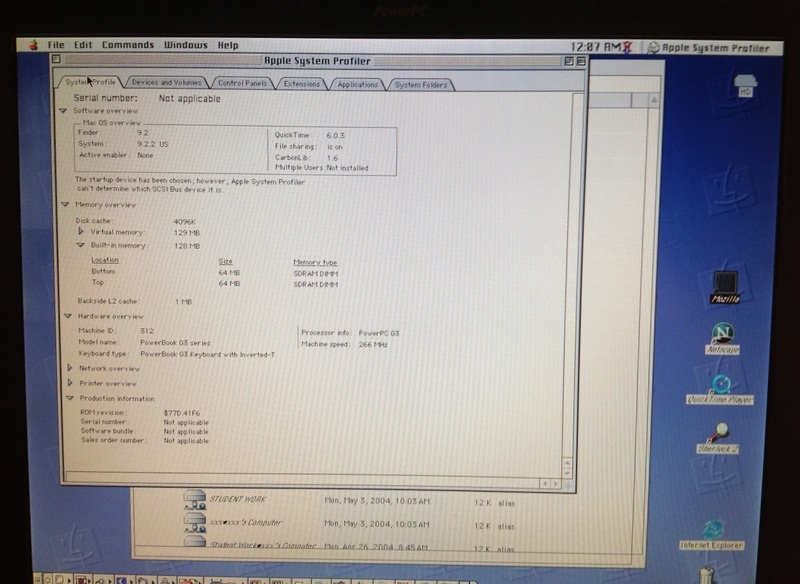 The Apple System Profiler says this machine has 128MB RAM, so someone probably upgraded it at some point. 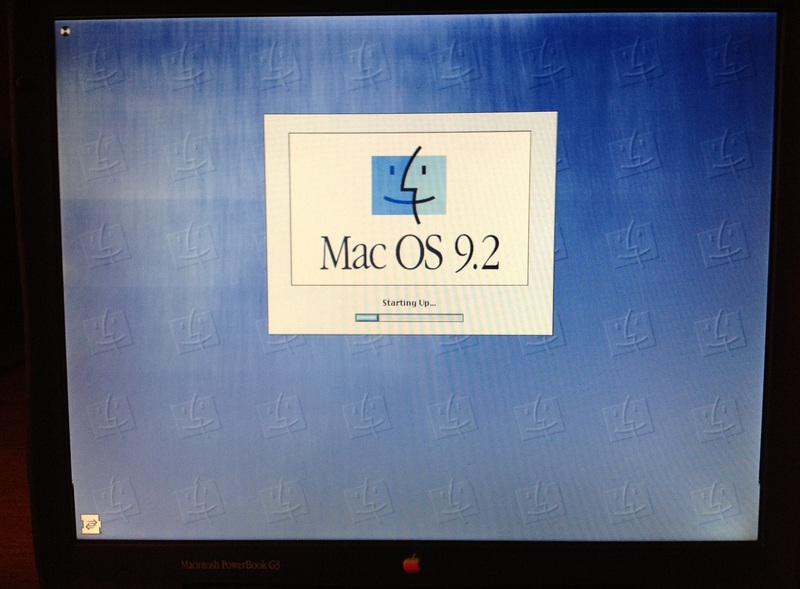 This machine because is clearly from a very transitional period for Apple shortly after Steve Jobs returned in 1997. On the lid is the new transparent/white Apple logo and on the inside is the color striped Apple logo they had used since the late 1980s (also my favorite version of their logo). The machine is powered by the Power PC G3 processor that would also power the first iMacs (the first stellar success that Jobs would have after returning to Apple) but the back of the machine reveals an Apple Desktop Bus port and a DIN-style serial port that would have been more familiar in older Macs from about 1986 onwards. You can immediately tell from the dark gray exterior that this is a Powerbook descended from the first Powerbooks in the early 90s. And yet, the generously large screen and the still-good-by-today’s-standards touchpad remind me off today’s Apple laptops. 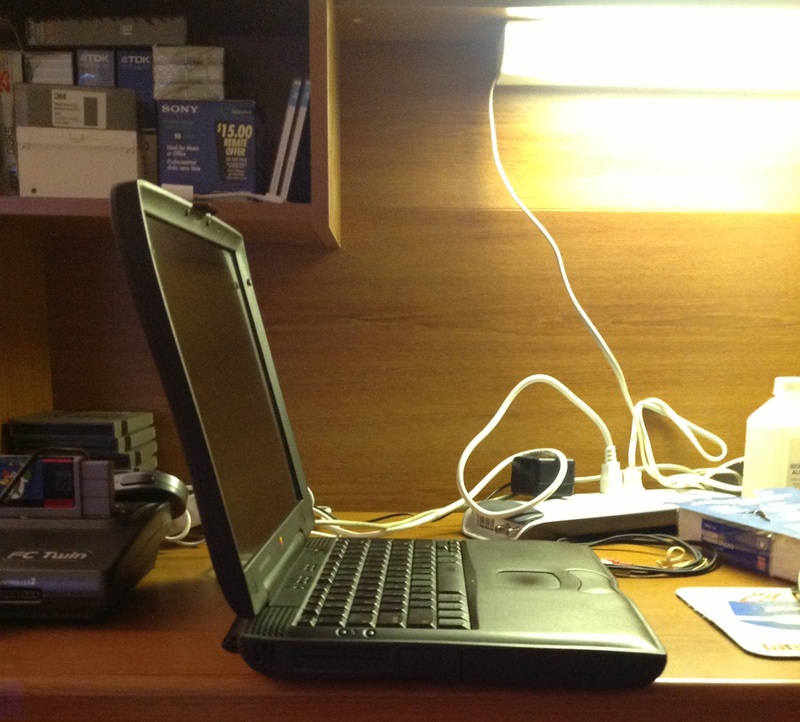 This is a computer with its feet in two eras in Apple history. 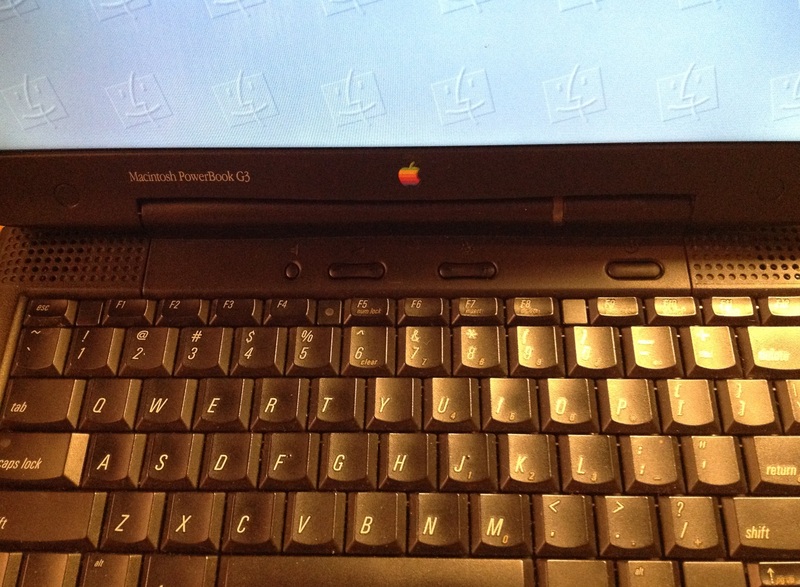 This Powerbook G3 is also a computer that feels like it represents the best of the era of Apple that was soon to be wiped away by brushed aluminum. The Apple of today produces really well engineered computers but they have turned brushed metal into the new beige. They want computers to look like fashionable Braun radios. Today’s Apple would never put a processor badge on their computers or build a laptop with two docking bays and a removable battery. We will surely never see a return to this philosophy, but this machine is a nice reminder of what once was. 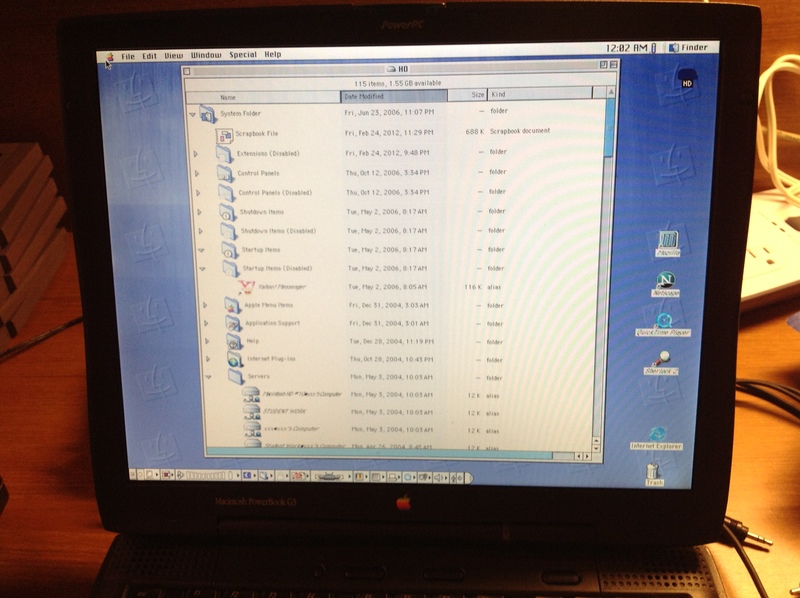 There was a wealth of old software on this Powerbook G3 including Mac OS 9.2.2, iTunes 2, Mozilla 1.0, Netscape, Internet Explorer 5 for Mac, and some Adobe software including Photoshop. 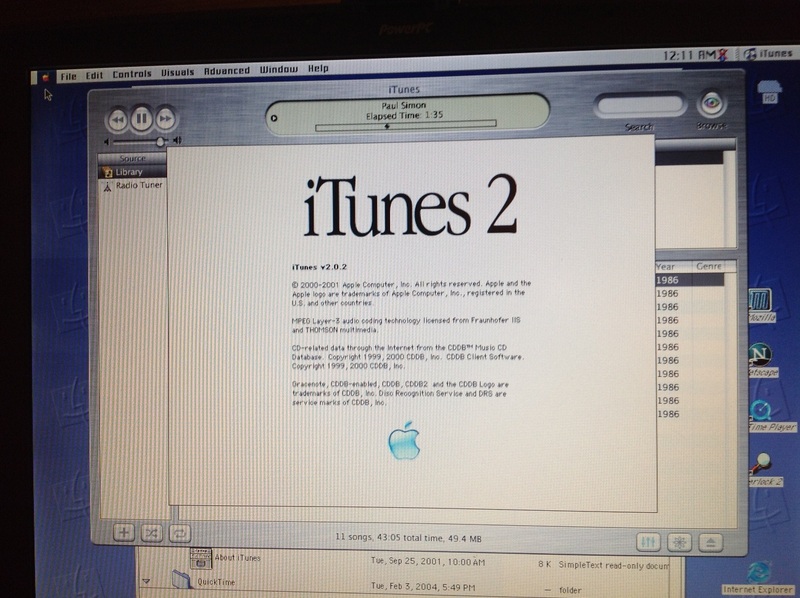 Seeing this ancient version of iTunes was particularly interesting for me because I use iTunes today on Windows. 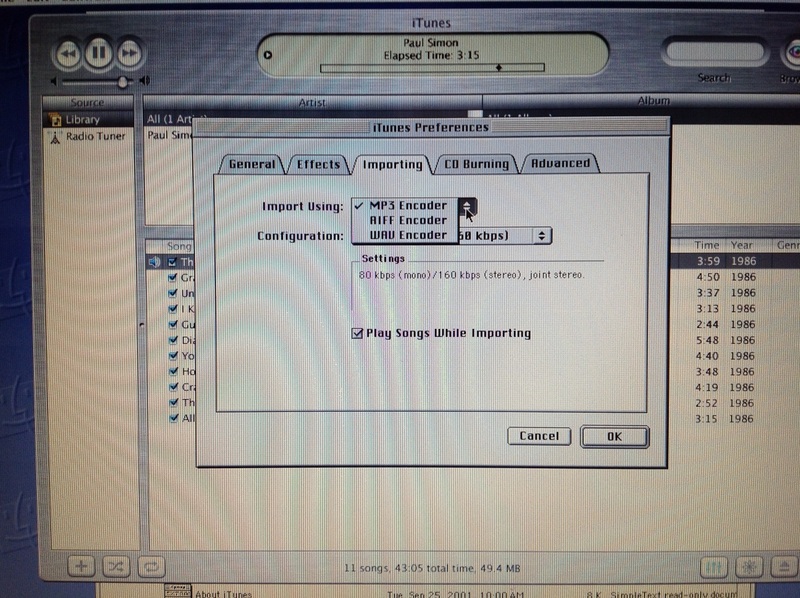 It’s hilarious to see iTunes without AAC encoding. As a die-hard Firefox user since 2003, I was also curious to see what Mozilla 1.0 looked like. 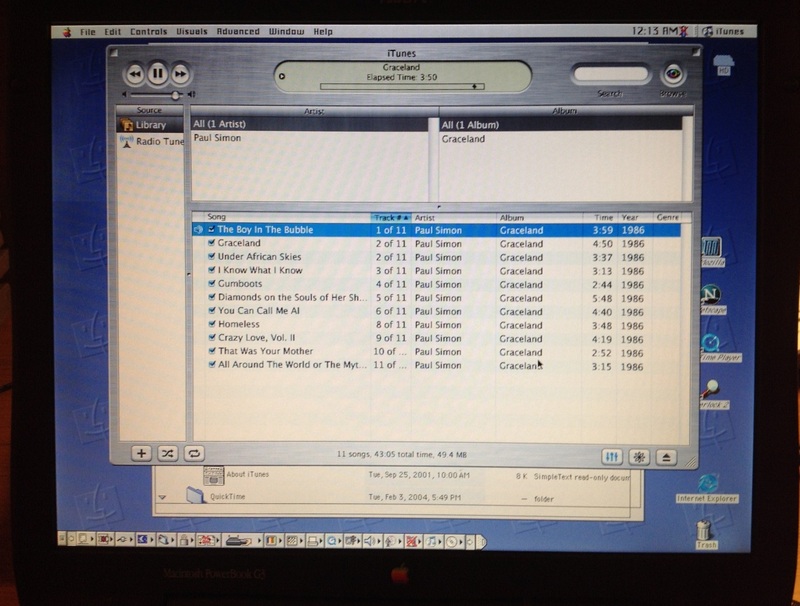 I also like silliness so here is the Goodtimes video from the Windows 95 CD being played on the Powerbook G3. I have quite a large collection of old software (which I will get to in future posts) but I was surprised to find that I had very little that will run on late model classic Mac OS. I tried SimCity 1.4c, but that complained about requiring 256 color mode and I wasn’t too keen on entertaining that foolishness. 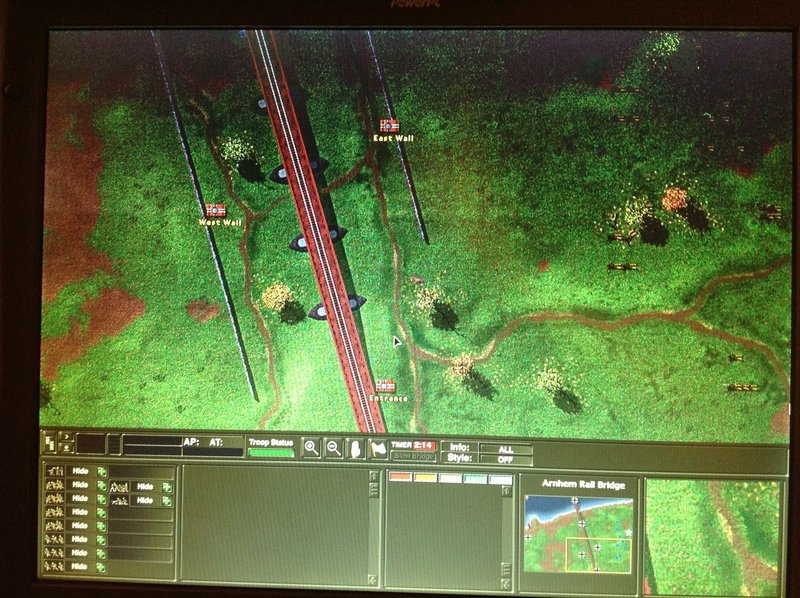 I did remember however, that one of my favorite games from the late 1990s, Close Combat: A Bridge Too Far, came with a Mac OS version on the same disc as the Windows version (surprising for a Microsoft published game). Here is what the installer looks like. The game doesn’t run badly and is surprisingly playable with the trackpad. Looking at this Powerbook is kind of like looking at an Art Deco building and thinking about the 1930s. The swooping curves of this machine remind me of the dynamism right before the Dot Com crash when the promise of all of that “multimedia” bunk from the early 90s was finally going to pay off with the Internet. It also reminds me that the Apple of the 1990s that almost died also died with this machine and that the Apple of the 2000s that changed the world in some ways was born with this machine. 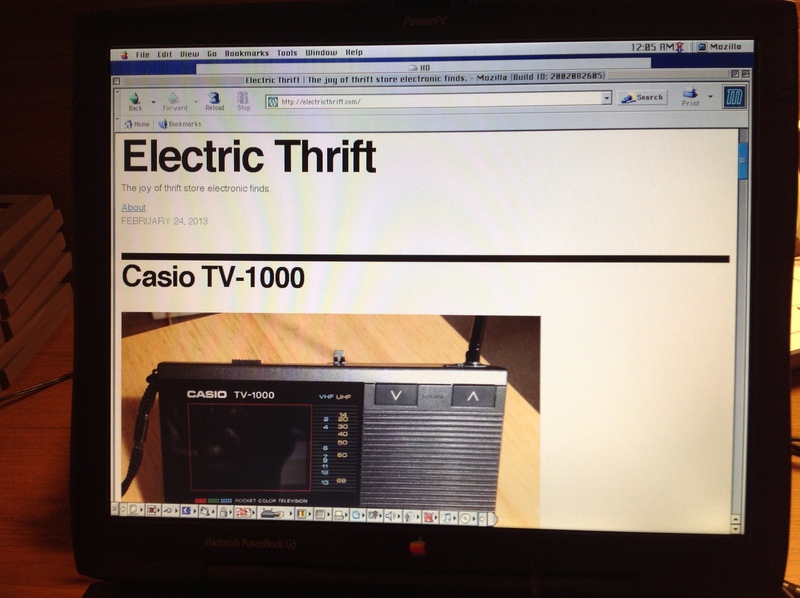 Nice short article on the old PowerBook. The Wallstreet is still a capable machine today with the right tweeks and upgrades. I’m typing up this reply using my Wallstreet running OS 10.4 and using TenFourFox as my browser. It is sluggish on some things and doesn’t play nicely with YouTube, but for most web pages it covers the basics. 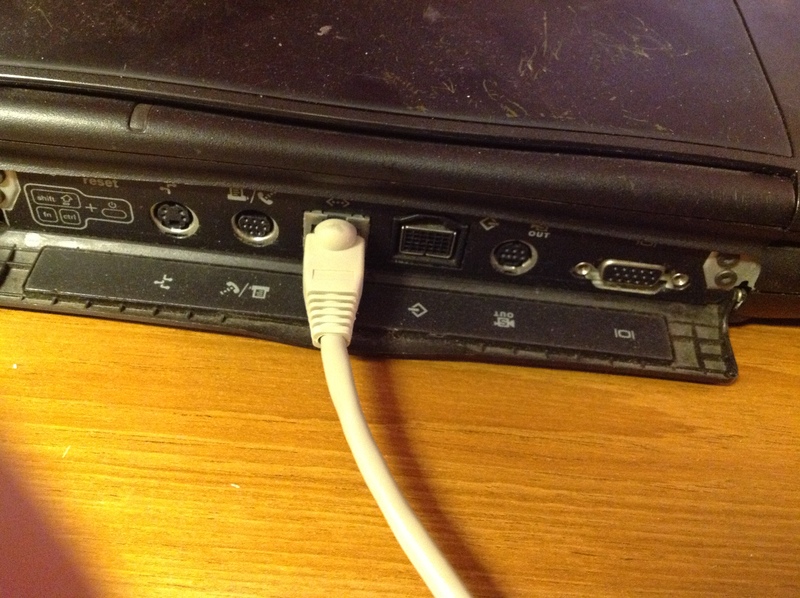 With an upgrade in ram, hard drive and processor plus a wireless card it does ok. 2 batteries let me run for around 5-7 hours, a dvd-burner lets me burn cd’s and dvd’s, and a USB and firewire card lets me connect to my flash drives and external devices. Plus, I can still connect to old legacy equipment with the SCSI and ADB ports. 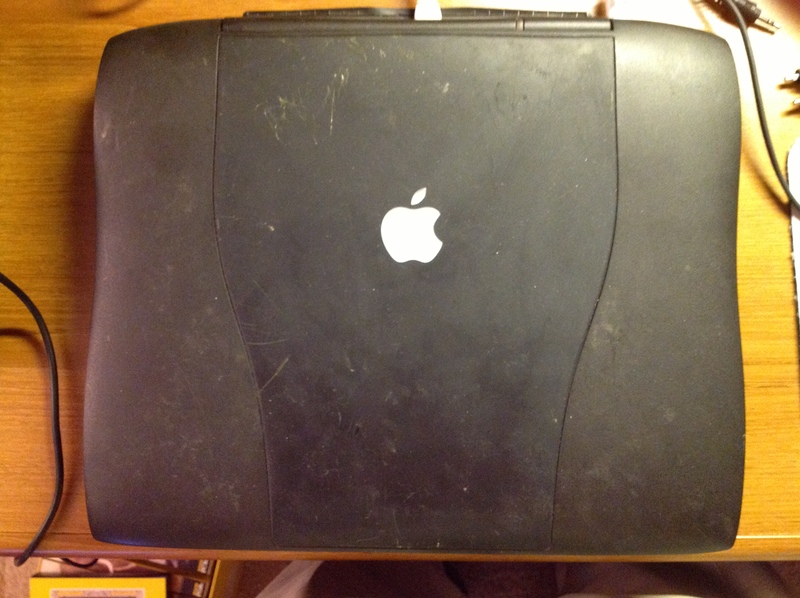 Still like my old Powerbook and I still get asked questions about about it. Apple adopted the rainbow logo in the late 1970s. The Mac got the DIN-8 RS-422 serial port and ADB with the II/SE line, in 1987; the Apple IIgs (not a Macintosh) was the first to use both ports.